Hello again Guillaume et Stéphanie, long time no (proper) see! Together with Les Amis des Musées d'Art et d'Histoire the Hereditary Grand Duke and the Hereditary Grand Duchess visited "The Family of Man" exhibition at the Château de Clervaux today. The couple already previously visited the exhibition by the late Luxembourgish-born American photographer Edward Steichen three years ago as part of their introductory visit to Clervaux. The exhibition including 503 photos by 273 artists from 68 countries was first shown starting in 1955 at the Museum of Modern Art (MoMA) in New York City. Since 1994, "The Family of Man" is shown at the castle in Clervaux, which interestingly has a family connection to Hereditary Grand Duchess Stéphanie: between 1631 and 1856 it was owned by a branch of the Lannoy family. 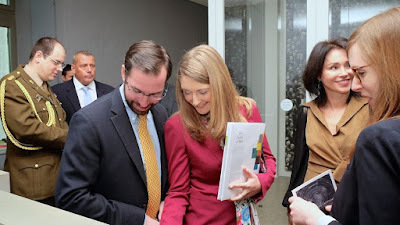 It is also the Hereditary Grand Duchess who has the connection to Les Amis des Musées d'Art et d'Histoire; since March 2013 she is the patron of the organisation.